These are a great economical accesorry for a rifle. The G2 is a high-output flashlight featuring a tough, corrosion-proof Nitrolon body and bezel. It uses a precision micro-textured reflector and a SureFire incandescent lamp to produce a smooth, brilliant beam with enough power to temporarily blind and disorient an aggressor by impairing his night-adapted vision. Output is either 65 or 120 lumens, depending on which easy-to-install lamp you use. High-output or ultra high-output. The pushbutton tailcap switch provides secure, ergonomic activation control--press for momentary-on, twist for constant-on. Magnum is now my all time favorite boot manufacturer. I received a pair from Magnum to see if they could replace my current Red Wing boots. They are excellent boots that fit well, are light weight and as comfortable as a running shoe. Many are available with a side zipper which allows you to get in and out of them without the hassle of untying. If you need a new pair of boots, I would highly recommend you try on a pair of Magnum Boots. Magnum will give you a full 60 days to try them out. If you don't like them, send them back no questions asked. My best guess says you will keep them. This is one of our teams all time favorite Red Dot Sights. These are super light yet built like a tank. You can drop it, you can toss it, you can place it on an IED. These are indestructible, and extremely versatile. They work on everything from .22 Marlin to AR15's to pistols. Aimpoint optics are worth every penny. We recently were in need of one of these to test out some optics. Our friends at SigSauerStore.com, were kind enough to send us one, and we liked it so well we thought we would pass it on. The Sig Sauer Bridge Mount attaches to the lower Picatinny rail of your pistol and allows a Red Dot or other optic to be attached to the firearm. These are lightweight polymer and strong. The bridge is simple to install or remove in a jiffy and there is an additional rail on the bottom to replace the one you are using. Simple, effective, affordable. The prices on these Streamlight TLR-3's has really come down to the bargin bin. At 67 bucks there is no reason to purchase an off brand anymore. 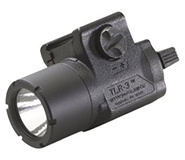 Ultra lightweight and compact, the TLR-3 Weapon Mounted Tactical Light features the latest in power LED technology and provides 1.5 hours of continuous runtime from a single lithium battery. Rail clamp designed to rapidly attach/detach from side of weapon. Search for shooting ranges near you, view video shooting tips and find other resources for shooters. Managed by the National Shooting Sports Foundation (NSSF), Where to Shoot is the web's most comprehensive directory of shooting ranges in the U.S. and Canada. This app brings that directory into the palm of your hand. Whether you're traveling or just looking for ranges in a specific area, Where to Shoot is a great resource for all gun owners and shooters. The clip portion is made of durable Kydex a material widely used in the firearm industry. The bottom flange of the clip is angled to create a clamping action as the barrel is seated onto the barrel retention rod. The clips are designed to allow the gun to ride low in the waistline, which creates a safe and secure ride height. The low ride height keeps the trigger completely covered and non-accessible until the weapon is drawn. The clip design requires the user to manually open it upon insertion into the waistline. This design insures the user's index finger is on the clip and not on the trigger. Once attached to the user's belt the clip will not come free until it is manually opened. The Leupold® RX®-750 TBR digital laser range-finder is a valuable long-range shooting tool. Accurate range in the field can mean the difference between a hit or a miss. The RX-750 TBR does more than deliver the straight line distance…you get the True Ballistic Range® to your target, based on the performance of your rifle or bow. Burris uses lenses with a greater diameter than the competition. "Signature Select" scopes lenses are 40% larger than the competition in 1" tubes. "Fullfield II" lenses are 25% larger than the competition in 1" tubes. The outer tubes & internal components are extremely robust. The adjustment system is repeatable, steel on steel with audible clicks. Double internal spring force. Every Burris scope has it.